Photo above: A female tiger marks her territory in Rantambore National Park. A story I illustrated on tiger conservation is published in the current edition of National Geographic Adventure magazine and their website features a slideshow of my photographs here. Kankwadi village in Sariska. 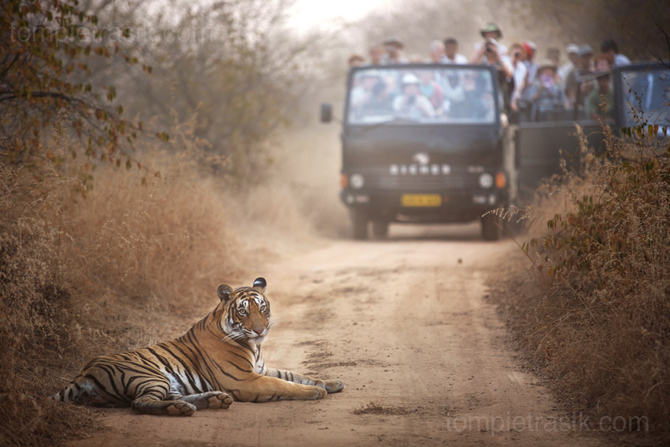 Humans living inside the national park are a potential threat to tiger conservation. Writer Paul Kvinta and I spent ten days working on this back in November. We had originally planned to follow the relocation of a tiger from from Ranthambore to Sariska national parks in western India. But chasing tigers isn’t easy and after three days without success the park authorities decided to abandoned the idea. Paul and I had to come up with an alternative focus for our feature. 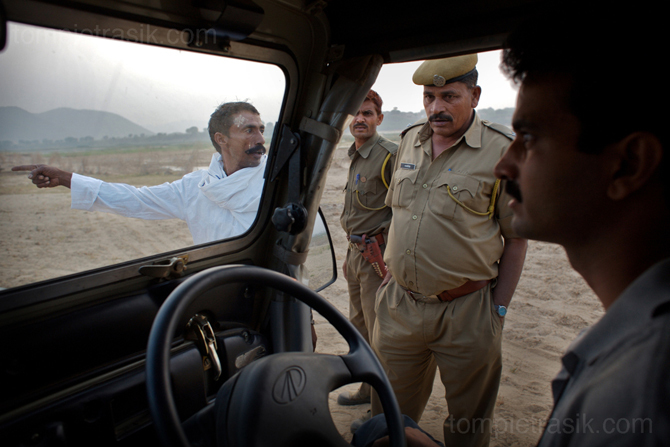 So instead of hanging out in the pleasant but rather staid company of the park officials who were organising the relocation, we began following Dharmendra Khandal, a maverick anti-poaching activist who heads a small NGO called Tiger Watch. 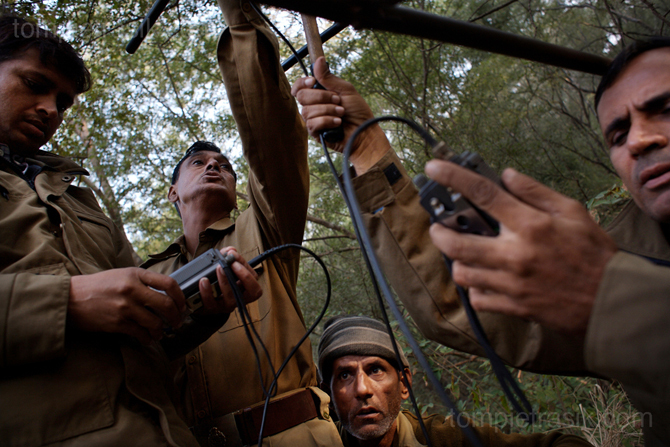 Critical of the park authorities and as a consequence shunned by them, Khandal runs his own show chasing down the poachers and gun-makers who have recently wreaked such havok on the tiger populations of Ranthambore and Sariska. 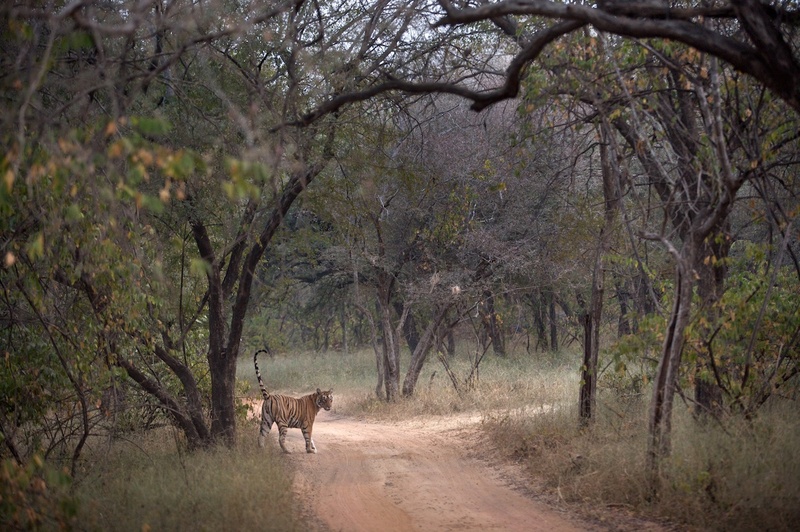 Park wardens try to track a tiger in Sariska Park. Sariska’s two tigers were introduced into the park in July 2008. Unlike the idle Victorian aristocrats that preceded them, todays tiger-hunters have plenty of motivation – albeit misguided – to hunt. Poachers in western India are almost exclusively drawn from the Mogia community. This landless caste are not only impoverished but they are completely shunned by mainstream society. It might sound obscene but Mogias are defined as a criminal-caste and as such they have to endure the distain of others higher up the pecking-order. The parks authorities are as guilty as anyone else for fueling the prejudice that condemns Mogia people to such desolate lives. Not only is this of course wrong it but it also happens to completely undermine the anti-poaching effort. 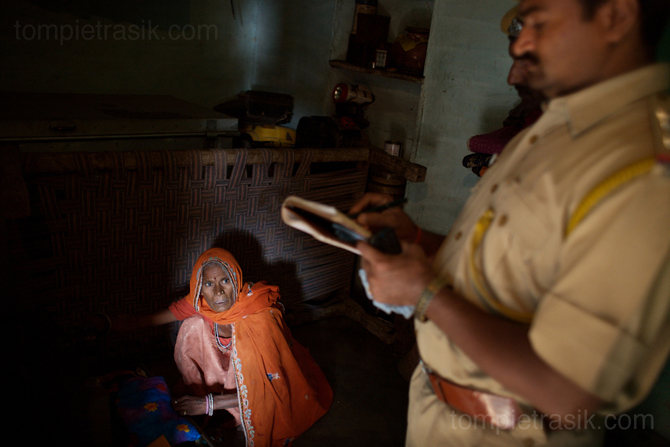 The wife of a gun-maker assists police as they search for evidence at her home near Rantambore National Park. In order to hunt a tiger, you must first be able to track it. It is these same tracking skills that are central to the task of monitoring and ultimately protecting tiger populations. It is no accident that those most adept at tracking happen to be the Mogia. What better way to address the challenge of tiger-conservation than employ Mogias in the parks service? Not only would this drain the pool from which hunters are recruited but there’s a good chance that former poachers would become the kind of local advocates for conservation that instill real grass-roots change. Unfortunately there are plenty of people in positions of influence that consider confronting caste prejudice as setting a dangerous precedent. While this sorry state of affairs continues, it is a bleak future that beckons for the Mogia people – and with them the poor tiger too. Thank you for your work with India’s tigers. It is absolutely devastating what is happening to this beautiful creature….and India’s national animal to boot! thanke’s brother for all work for tiger’s from all our indian’s who love these god’s amaging & beautiful creature’s we want’s many tom’s for conservation of our tiger’s thank’s you must go on your path with god. this documentary was amazing from a students point of view as well…..congrats for making a commendable visual documentary with the kind of picture says it all view.